This lesson continues from the 12/8 Basic Drum Fills lesson by building up the complexity of patterns that can be performed in this time signature. If you are not able to perform the fills found in this previous lesson then I recommend you go back and check them out as the ideas found in this lesson can be a little tricky. Each drum fill has been written at the end of the bar with a basic groove preceding it. This is simply to show where the drum fill starts as well as giving you a basic drum beat to practice it with. Eventually you want to be able to play these ideas with the drum beats found in the 12/8 Intermediate Drum Beats lesson as well as with your own grooves. I recommend that you learn these fills off by heart (if possible) so that when played you aren’t having to think about it so much. This allows you time to be thinking about the more important things such as where to place the drum fill and what drum fill to use rather than how to actually play the drum fill itself. All the fills have the suggested sticking’s written above them but feel free to experiment with your own hand combinations. It is possible to use sixteenth notes within the 12/8 time signature in order to create excitement and speed within your drum fills. Sixteenth notes are played faster than eighth notes (obviously) so can sound more impressive. Each eighth note is replaced with 2 sixteenth notes which means that a whole Beat of 3 eighth notes can now be played as 6 sixteenth notes. The first five examples below start on Beat 4 of the bar and mainly utilise the hands to execute the fill. If you are finding it hard to play the sixteenth notes at the correct rate (speed) then a useful trick is to notice how the right hand is still playing on the eighth note. The left hand is simply playing in between. If you perform this fill correctly and were to keep your right hand on the Hi-Hat while executing the drum fill you would notice how the Hi-Hat eighth notes continue through the entire bar uninterrupted. Again, the left hand is only playing in-between what the right would play on the Hi-Hat. One popular way of orchestrating this rhythm is to split the 6 notes up into 3 groups of 2 as shown here. Alternatively you can split it into 2 groups of 3. Note how the left hand moves to the High Tom and not the right hand. Playing groups of 3 like this around the drums can cause problems at speed as the hand that moves to the next drum alternates between right and left. A very effective way of moving triplet based ideas around the drums is to use the sticking R L L as shown here. Each group of 3 notes starts with the right hand and so no confusion occurs between hands when moving from drum to drum as seen in the previous fill (Drum Fill 3). If your doubles aren’t particularly fast then you might find this sticking limiting at high tempos. This is a cool way of taking the previous fill further with the inclusion of the bass drum underneath the crash cymbal. This next section will look at how the bass drum can be included within the drum fill in order to give many more possibilities and creativity. Not only does the inclusion of the bass drum give the fills an extra dimension it also gives the hands time to move to a different drum if required. This is a very useful aspect especially when the fills are performed at high speed. 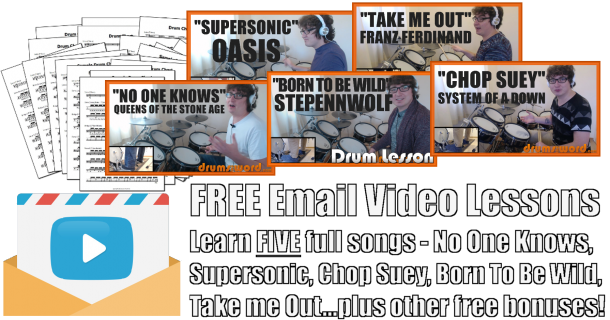 I recommend that you try to learn these ideas with a single bass drum to start off with. You can then move to the double pedal after (for the fills with bass doubles) if more speed is required or your bass drum doubles are not up to scratch. There are eight very common six note hand and foot combinations that drummers tend to use. These combinations are shown below followed by a suggested way of orchestrating the idea around the drums. Technically some of these hand/foot combinations are actually 3 note ideas repeated twice or 2 note ideas repeated three times. Whatever the case, you will find these combinations being utilised by drummers everywhere and are a great place for you to start if you’ve never considered using the bass drum in this way. Some of you might recognise this triplet based combination as a favourite amongst drummers such as Steve Gadd, John Bonham, Dave Weckl…in fact, just about every great drummer out there uses it these days. This can be technically demanding as the hands move from left/right to right/left. Making this flow and sound smooth is harder than it looks. This idea is more popular amongst less technical drummers than the previous fill because the hands start each group of 3 notes. It does mean however that the bass drum at the end of the 6 notes has to flow into the bass drum on Beat 1 of the next bar. This is a cool idea to play around with. Notice how the right hand is actually playing the eight note while the bass drum slips in-between. Just like the first drum fill at the beginning of this lesson, the right hand should feel like its playing eighth notes all the way through the bar – because it is! Splitting the six notes up in this way actually creates something known as a polyrhythm. The three groups of 2 notes pulls the listener away from hearing groups of 6 notes and into hearing groups of 2. One nice idea employed by drummers is to move the hands around the toms as flams. If you’re not sure how to perform flams then please check out The Flam Rudiment lesson found on this site. The same as the previous fill but starting on the bass drum. Now its the bass drum that will be performing eight notes. This can sound a little like a double bass drum pattern especially if the floor tom is tuned low to sound like the bass drum. Another example of how to split 6 notes up into three groups of 2. This can really mess with your head when trying to learn this grouping because its hard to hear the fill as 6 notes and not three groups of 2. There are lots of bass drum notes in this idea so it is probably best performed on a double pedal unless your single foot technique is adequate. If you want to include a bass drum note on Beat 1 of the bar following the drum fill then you would have to play three bass drum notes in a row! Not many drummers can do this at medium to fast tempo but that shouldn’t stop from you from trying. Give it a go! The same as the previous fill but starting with the hands. This means that its much easier to perform at speed because the hands end the 6 notes. No three bass drums in a row here! This is a very popular grouping of 6 notes. The two bass drums at the end give the hands time to move to other drums if the 6 note idea is looped. In this example the 6 note idea ends the bar and so we have the same problem as previous examples, i.e. three bass drum notes in a row when returning to Beat 1 of the bar. The very last drum fill in this lesson shows how this idea can be used within a drum fill without actually ending the bar. The problem with the previous fill is overcome with this idea as the bass drum starts the pattern. The last section of this lesson gives you ideas on how to combine all the previous drum fills into new ideas. These are just a few of the many, many permutations possible. Have fun combining them in your own way! These drum fills start on Beat 3 of the bar and so contain 12 sixteenth notes (two groups of six). The 12 sixteenth note drum fill on the snare drum. Be careful that the hands don’t get confused when moving from drum to drum as previously discussed. Using the R L L sticking means that the right hand has no problem moving down the toms. The first six notes use the R L L sticking while the last six notes are played as single strokes ( R L R L R L). Phew! That’s a lot of ideas for you to think about and have a go at. Hopefully you can see the logic behind how this lesson was structured. Its possible to split six notes up into different numbers of groups either played with just the hands or both the hands and bass. You can use this lesson as a great place to start when learning to combine the hands and bass drum together. These six note groupings can be played through any subdivision and any time signature so don’t think they’re limited to only sixteenth notes in the 12/8 time signature. I like to use these drum fill ideas within sixteenth note triplets for example. The possibilities are endless when it comes to hand and foot combinations so why don’t you try out your own ideas.